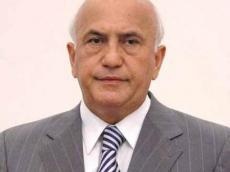 Azerbaijan’s former health minister Ali Insanov has been pardoned upon presidential decree. Azerbaijan’s President Ilham Aliyev has signed a decree to pardon a number of convicts and upon this decree, Ali Insanov has been freed from the unserved part of his sentence. Ali Insanov was arrested in October 2005. He was accused of embezzling state funds and organizing illegal privatization of state assets. In April 2007 he was sentenced to 11 years imprisonment with confiscation of property. Insanov's term was to expire in October last year. In 2017, Insanov was charged under Article 234.1 (Illegal purchase, storage, manufacturing, processing, transportation without a purpose of selling of narcotics or psychotropic substances in a quantity (amount) exceeding necessary for personal consumption), Article 315.2 (Resistance to the authorities in the performance of their duties, with the use of violence not dangerous to life and health, the use of such violence or threat of violence against him and his relatives in connection with the performance of official duties, application of the violence dangerous to life or health, concerning persons specified in the article) and Article 317- 2.1 (The preparation, keeping, concealment, carrying, transportation or use of prohibited items by a person held in penalty institutions or investigation isolators, the same acts if they are committed repeatedly) and was sentenced to 7 years and 5 days imprisonment by the Garadagh District Court.